Landscape with huge banyan tree beside a river. bl.uk > Online Gallery Home	> Online exhibitions	> Asia, Pacific and Africa Collections	> Landscape with huge banyan tree beside a river. Watercolour of a landscape scene by an anonymous artist working in the Calcutta style, part of the Gilbert Collection, c. 1825. The banyan tree or agrodha (Ficus bengalensis) is one of the truly massive trees of north India and is a tree associated with healing and protection. 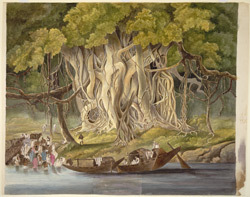 This drawing depicts a huge Banyan tree beside a river with boats stationed nearby and villagers bathing in the foreground.